Home Depot Garden Club | A Savings WOW! 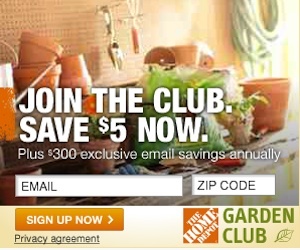 Sign up for the Home Depot Garden Club and receive a coupon for $5 off your next lawn and garden purchase of $50 or more. This is very useful if you have some fall spruce up or decorating to do around your home.